To obtain a high quality snack product, it is essential to continuously monitor frying oil. CDR FoodLab® enables to control the quality of frying oil directly during the manufacturing stage with a fast, simple and reliable method. In industrial frying quality staff may monitor several chemical parameters during the frying operation in an effort to maintain optimum product quality. In fact monitoring frying oil is essential to avoid unpleasant effects on finished snacks products. Manufacturing plants usually have a filtering system that is designed to extend the life of the oil, while drastically reducing costs. However, it is still important to identify the parameters that indicate a progressive degradation of oil, as a result of the fact that physical and chemical properties of fried oil and fat tend to change significantly after extensive use. The most common chemical test conducted by fryer operators is for Free Fatty Acids (FFA), because frying process causes the increase of the FFA. In addition to this, it is important to consider that the frying process also produces peroxides that immediately transform into polar compounds due to the high temperatures. Thus, Peroxide Value (PV) cannot be regarded the sole indicator. The frying process also produces several volatile and non-volatile compounds including aldehydes and ketones. A study carried out on soybean oil used to fry chips showed that the p-Anisidine Value (AnV) was significantly influenced by the concentration of aldehydes and polymers, and by other sensorial evaluations. Given these considerations, the appropriate indicators to monitor the quality of oil during the frying process appear to be Free Fatty Acids (FFA), p-anisidine value (AnV) and Peroxide Value (PV), while the quality of incoming oil can be assessed using Free Fatty Acids and Peroxide Value as indicators. The limit values for each parameter that is indicative of physical and chemical alterations are influenced by several variables that include the type of oil, the type of food being fried and the frying method. It is therefore necessary to define experimentally the threshold values that represent the critical process control points. These values can provide an effective indication of whether the frying process complies with the requirements necessary to ensure a product with a high final quality. 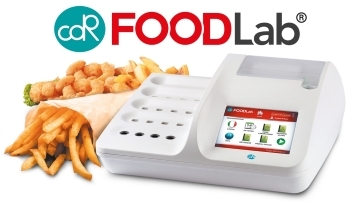 CDR FoodLab® is the ideal system to monitor the degradation of frying oil, cooking oil, waste oil. CDR FoodLab® system is intensively using for the quality control in frying industry since many years. It is used from the quality control of the oil to the entire frying process in order to manage it at best avoiding dangerous of flavours. With the possibility of Shelf life determination CDR FoodLab® becomes an important system that allows the frying industries to realise a complete quality control from the oil to the packaged final product. Tests to monitor quality of deep-frying oils was last modified: November 27th, 2017 by CDR s.r.l.